This property is located close to transport links, shops and restaurants, only few km from St. Peter. Free parking area just below the house and bus stop at 20 metres. At 10 km from the new Exhibition Area (Fiera di Roma) and 22 km from Fiumicino Airport and the sea coast. To have an attic in Rome is not for everybody and this is what the "Aroma di Roma" b&b gives to its guests: a top floor attic studio in elegant and quite building, with separate entrance, en-suite private bathroom with shower, suitable for 4 persons (1 double bed and 2 single beds), air conditioning, heating, LCD TV and other personal touches that make our guests feel at home. But what truly makes the difference is the ability to use the fully equipped kitchenette and enjoy the enormous terrace, with table, chairs, barbecue and solarium, for dining under the stars and enjoying the aroma di roma, the scent of flowers that in the evening mixes with the air of sweet Ponentino creating an unique atmosphere. 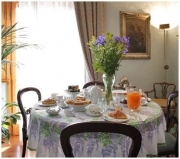 For breakfast we offer 2 different options to our guests: a full breakfast served in the dining room of Rosanna’s flat, located one floor below the b&b; and a selfservice breakfast that can be enjoyed in the privacy of the “mansarda” open space with all the necessary in the kitchenette. Both breakfasts include bread, croissants, cakes, biscuits, tea, coffee, cappuccino, milk, chocolate, juice, almonds’ cream, assorted jams, honey, yogurt, butter, cereals, cheeses and cold meat.